WASHINGTON, D.C. -- Barack Obama's legacy appears to be on the right track, as 63% of Americans in hindsight say they approve of the way he handled his job. 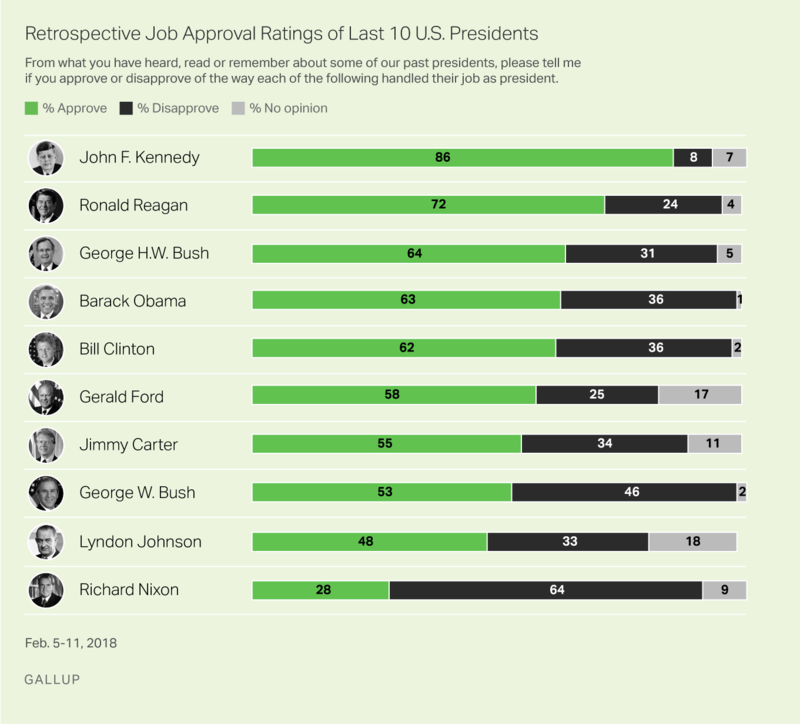 Gallup's first measure of Obama's retrospective job approval rating places him behind John Kennedy and Ronald Reagan among the 10 most recent presidents. Richard Nixon is rated worst today for how he handled his job, with 28% approving. The results are based on a Feb. 5-11 update of a question Gallup has asked periodically since 1990 about former presidents. Obama's 63% retrospective approval rating is slightly higher than the 59% he received in Gallup's final measurement of him as president in January 2017. It is well above his average 48% job approval rating for his presidency. Americans' retrospective approval rating of Obama is essentially the same as those for George H.W. Bush (64%) and Bill Clinton (62%). Gerald Ford and Jimmy Carter have ratings in the mid- to upper 50s, but fewer Americans have opinions of those presidents, who served from 1974-1977 and 1977-1981, respectively -- accounting for some of the differences between them and more recent presidents. A slim majority of Americans, 53%, approve of the job George W. Bush did as president, higher than only Nixon and Lyndon Johnson (48%). Johnson, however, has a lower disapproval rating than Bush (33% versus 46%) because fewer respondents offered an opinion about Johnson's presidency, which spanned 1963 through 1969. Presidents' retrospective ratings tend to be closer to their final individual job approval rating as president than to the average approval they received over their entire term. But retrospective approval ratings usually exceed both their final and average approval ratings when they were president. All but Johnson and Clinton have at least marginally higher retrospective ratings than final ratings, and all but Johnson and Nixon have higher retrospective ratings than average approval ratings. Retrospective job approval rating is from Feb. 5-11, 2018, Gallup poll. Average job approval rating is based on president's entire time in office. Final rating is the last approval rating from a single poll that Gallup measured for the president before he left office. The rank-order of presidents has generally been stable over time. Kennedy has always ranked first across the nine times Gallup has asked the question since 1990. Nixon has been last or tied for last (with Johnson in 1992 and 1993) each time. Retrospective approval rating percentages for the nine ex-presidents from Kennedy through George W. Bush are mostly unchanged in comparison with the prior readings from 2010. There are two exceptions, however. Clinton's approval rating has slipped seven percentage points, while Bush's has improved by six points, over the past eight years. Clinton's presidency has attracted renewed scrutiny as part of the national discussion on sexual harassment, given past allegations of sexual misconduct against him, including while he was in the White House. He also re-entered the political fray in 2016 when Hillary Clinton campaigned for president. His retrospective approval rating has fallen 12 percentage points among Republicans (from 47% to 35%), five points among independents (from 68% to 63%), and nine points among Democrats (from 93% to 84%) since 2010. Clinton is now back where he was in 2006, when 61% approved of his presidency, but remains well above the 51% he received in his initial retrospective rating in 2002, just over a year after he left office. Clinton may have had a higher rating in 2010 because Americans were comparing him with Obama, who had a relatively low 45% job approval rating at the time. 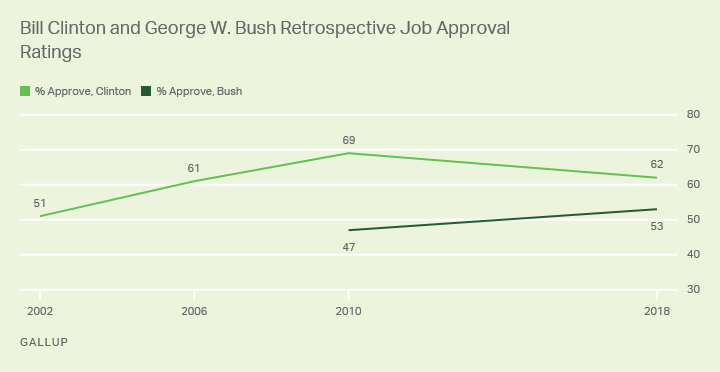 Similarly, Bush may now be seen in a more favorable light in contrast to his fellow Republican Donald Trump, whose job approval rating is currently 40%. Bush's improved ratings are largely a result of more positive reviews from Democrats -- 38% approve of him, up from 17% in 2010. Independents' ratings are up slightly, from 44% to 50%, while Republicans' views of Bush are slightly worse, dropping from 83% to 76%. Obama joined other ex-presidents this week in having his portrait displayed in the National Portrait Gallery. Obama receives better ratings from Americans in retrospect than he did for much of, if not all of, his active presidency -- similar to the pattern seen for most other presidents. Americans may view former presidents more as ceremonial than political figures. They may also forget some of the policy disagreements or other factors that may have caused them to rate presidents less positively when they were in office. Also, younger Americans with no firsthand knowledge of certain presidents' actions may get a mostly positive image of them from history books. Obama's initial retrospective rating is better than those for his immediate predecessors, including George W. Bush (47% in 2010), Clinton (51% in 2002), George H.W. Bush (58% in 1993) and Reagan (54% in 1990). While ex-presidents' retrospective ratings tend to stabilize after they have been out of office for a while, it would not be unusual to see movement in Obama's ratings, as occurred for the younger Bush and Clinton in the current poll, and Reagan and Carter in polls in the late 1990s and early 2000s. If Obama's retrospective ratings show improvement rather than decline in the future, he could join Kennedy and Reagan in the upper echelon of former presidents. 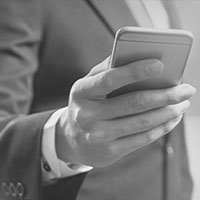 Results for this Gallup poll are based on telephone interviews conducted Feb. 5-11, 2018, on the Gallup U.S. Poll, with a random sample of 1,512 adults, aged 18 and older, living in all 50 U.S. states and the District of Columbia. For results based on the total sample of national adults, the margin of sampling error is ±3 percentage points at the 95% confidence level. All reported margins of sampling error include computed design effects for weighting.